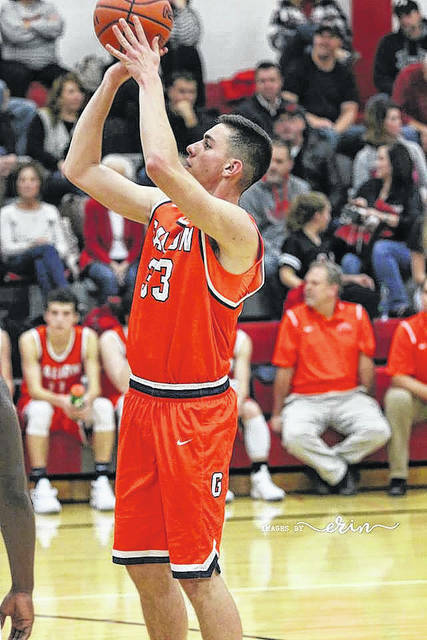 Erin Miller | Galion Inquirer Colten Skaggs concentrates on his free-throw attempt during MOAC basketball action last Friday evening at Pleasant. Galion opened their conference schedule with a 65-44 loss to the Spartans. MARION — The 2017-2018 Mid-Ohio Athletic Conference schedule began last Friday, December 8 for the Galion Tigers boys basketball team. Kicking off that schedule, the Galion squad loaded up the buses and headed over to Marion to meet up with the Pleasant Spartans. Galion would drop their second straight contest as they were handed the road loss by Pleasant; 65-44. The Tigers are now 1-2 overall and 0-1 within the MOAC. The Spartans improve to 1-1 on the season and 1-0 in the conference. Isaiah Alsip was the only Galion player to finish in double figures, netting 12 points to go along with one rebound, an assist and three total steals. Colten Skaggs recorded eight points, 13 rebounds, an assist, a steal and a block for the contest as well. Zhamir Anderson contributed seven points on the offensive end and swiped five steals on defense. Other Tigers stats versus Pleasant were: Team- 15/50 (30%) total field goals, 12/39 (31%) from the interior, 3/11 (27%) from the perimeter, 11/18 (61%) free throws, 25 rebounds (10O, 15D), 2 assists, 15 steals, 3 blocks and 26 turnovers; Jack McElligott- 7 points, 1 rebound, 2 steals; Gage Lackey- 5 points, 4 rebounds, 2 steals, 2 blocks; Tristan Williams- 4 points, 2 rebounds; Colton Powell- 1 point, 4 rebounds, 1 steal and Nate Eckert- 1 steal. The Tigers will host conference foe, the River Valley Vikings, on Thursday, December 14 before traveling back to Marion for a matchup with Harding on Saturday. UPPER SANDUSKY — Galion’s boys basketball team made the trek to Upper Sandusky last Thursday, December 7 to clash with the Rams in non-conference action. Upper would go on to a 41-point win over the visiting Tigers; 87-46. Alsip would score 17 points against the Rams defense and round out his stat line with three rebounds and two steals. Anderson finished the contest with nine points and three steals while Lackey and McElligott chipped in eight points apiece for the Galion squad. Other stats against Upper were: Team- 19/55 (35%) total field goals, 18/39 (46%) from the inside, 1/16 (6%) from the outside, 7/13 (54%) free throws, 19 rebounds (7O, 12D), 2 assists, 10 steals, 2 blocks and 24 turnovers; Lackey- 6 rebounds, 1 block; McElligott- 2 rebounds, 1 assist, 2 steals; Powell- 2 points, 2 steals; Skaggs- 2 points, 7 rebounds; Williams- 1 rebound, 1 assist and Carter Keinath- 1 steal, 1 block. https://www.galioninquirer.com/wp-content/uploads/sites/38/2017/12/web1_Skaggs.jpgErin Miller | Galion Inquirer Colten Skaggs concentrates on his free-throw attempt during MOAC basketball action last Friday evening at Pleasant. Galion opened their conference schedule with a 65-44 loss to the Spartans.